At our Sunday service on January 21, we held a Promise & Practice service, as hundreds of UU congregations have committed to doing, in response to an ask by the Unitarian Universalist Association. You can read more about it here. 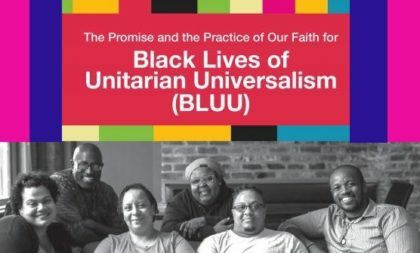 The service consisted of elements, all of which were written by Black Unitarian Universalists. I fear that others will continue to be hurt, misjudged and mistreated in my current state of ignorance and while my eyes are opening up. That we don’t do enough to move forward, and not repeat our mistakes. That I and those around me will settle in complacency. I fear I may make a racist remark/behavior. That our country will take a long time to recover from damage done. Hope for caring, respect and awareness that we turn towards inclusivity and equity. That I continue to learn to see with different eyes, so that I may not only be a better, more observant witness, a more informative advocate, a more authentic friend to all those in my life who do not look like me. That current movements (BLM, #metoo, etc.) will have the impact they intend to and bring people of all backgrounds together. Hope that UU will fulfill their promise of inclusiveness. This will be a lasting change in UU. This nation wakes up one day. That people of good intention will act to change things. I fear I am too broken to move beyond my own struggles and help others. Read those two again. Slowly. Without distraction. Say them aloud. They are poignant. They are real. None of us is alone. Not in our brokenness or our fear of our brokenness. Not in our hopes for a better world for those who come after us, for those with whom we share this planet. We are in this together. It is the collective nature of our hopes and fears that is the warp and weave of the interdependent web. This is where we bring awareness to our shared past and where we co-create our shared future. None of us is alone. We need each other to survive.